This photo is from my personal collection. It is one of about 1000 that were in 15 photo slide carousels of my grandfather's, Michael John Hanley (1924-2015). For probably the last 30 years the dusty boxes that housed these photo slides were stored in the closet underneath the stairs at the cottage that has been in our family for several generations. I'm amazed at how clear some of these photos are after they are scanned and digitized. The colors really pop! Here is an example. Here is some of the detective work I used to determine that this photo was taken on Grant Avenue in San Francisco's Chinatown around 1969. My grandfather labeled the carousel this slide came from "Hawaii 69". That is the only information I had to go on. I knew from family stories that he took at least one trip there. This didn't look like Hawaii to me so I tried googling some of the signage on the buildings. One that caught my eye was the red awing slightly left of center. If you zoom in you can see what appears to be "Louie's of Grant Avenue." 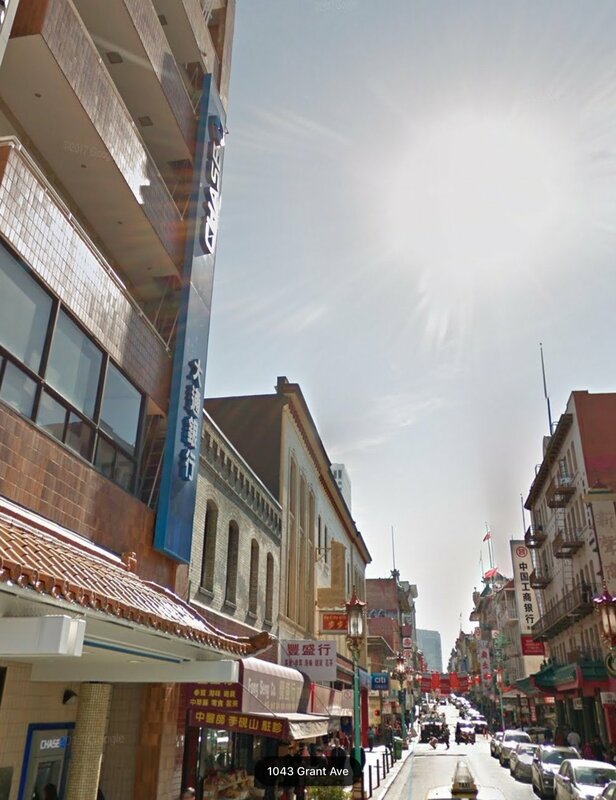 Nothing specifically came up about Louie's, but it became clear that there was a well known "Grant Avenue" in San Francisco, California's Chinatown district. This fit with the Chinese signs you see in the photo. My guess was that en route to Hawaii my grandparents stopped in San Francisco. Enter: Google Maps. To confirm that this was Grant Avenue I looked at some street views in Google Maps. Here are four screen captures of the relevant views that I found. See if you can spot the details that helped me confirm the location of Pic of the Week (#36). In the original photo you see a cut off store sign that says "....SHEIM shoes" on the top right. I assumed this to be the popular Florsheim Shoes brand. Comparison photo A and B both have the same Florsheim Shoes sign. I zoomed in on photo B so as to produce the similar cut off view as in the original photo. The other details that caught my attention are the buildings on the center left of all of the photos. In the comparison photos, just above the "Chase" sign you will see two buildings of very different heights. The first one has four long, narrow arched windows with decorative architectural details on the top. Photo D shows a closer view of those details. Though there is no "Chase" sign in the original photo you see the very same buildings. Nothing seems to have changed. It is safe to say that we know exactly where my grandfather was standing when he took this photograph in 1969. These photos were taken nearly 50 years apart and in drastically different ways. The Pic of the Week (#36) was taken with with a film camera to produce a photo slide that was projected onto a screen (or white sheet) for family and friends to see. The comparison photos were taken with a high tech 360 degree digital camera mounted on the top of a car as it drove around mapping the streets of San Francisco to put in cyberspace for people to see on their phones so they know where to go. Do you have some old photo slides hiding in your basement or attic right now? Do yourself a favor and digitize them. The image quality and colors can be stunning. A professional photo restorer will charge you about 45 cents per slide to digitize. For a little over $200 you can get an Epson Perfection V600 Photo Scanner, which is what I did, and do it yourself. This is a stand alone scanner (i.e., doesn't print) that can handle photo, film, slides, and everyday documents. Your basic combination printer/scanner likely does not have the capacity to scan film or slides. I think it is worth the investment to get a stand alone scanner that will give you more options, better quality, and more control. There are cheaper and much more expensive options available for slide and film scanning. The Epson V600 seemed to be best suited for my needs. The process can be long. I estimate I can scan about 20-30 slides in an hour (the V600 can handle 4 at a time). As I have played around with some settings I have been able to become a little quicker. I initially ran into some wonky driver and software installation problems trying to connect this scanner to my MacBook Pro. Once those were fixed things have been running flawlessly. It has been a real joy to give these old slides some new life. Those in my family who have seen these images have only ever seen them projected onto probably a white sheet hanging on the wall of family room or basement. It is an honor to bring them into the digital age so that, perhaps 50 years from now, my grandkids can look at them on whatever device they have at the time.